30 bone hut sites out of Mammoth bone made by prehistoric humans during the Paleolithic period has been found (as deep as 22.5 m deep) in Czech Republic, Poland and Ukraine in Europe. 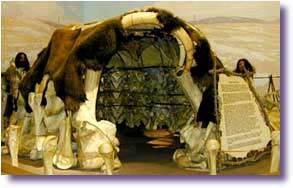 The huts and houses were Circular or oval huts and as much as 15 to 20 feet in diameter. The oldest are dated to be 27,500 years old, (Ukraine houses are dated at between 12,000 and 19,000 years ago) and whole villages have been found, being the oldest towns found. 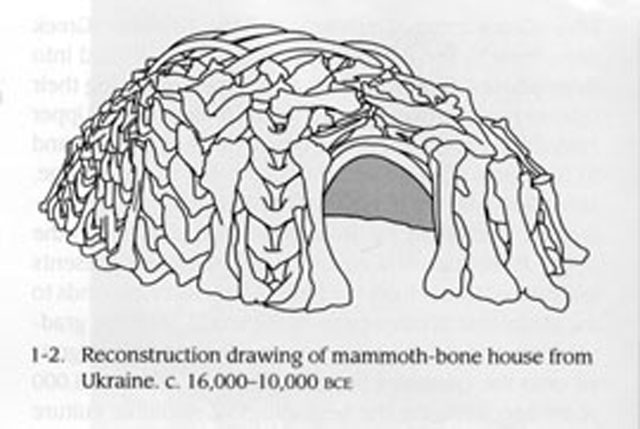 Humankind started creating urban centers like those clusters of homes 15,000 years ago, during the Ice Age.